I'm a tea drinker. I used to be a coffee drinker. I won't bore you with the details of why I switched to tea...but I do have my reasons. The truth is, I miss coffee. A lot. Sometimes too much. When those "sometimes" get too strong, I give in and have a cup (or two...shhhhh). Here's the problem: since I don't drink it very often, my tolerance for the high amount of caffeine in a cup of Joe has gone way down. WAY down. Which means one thing...I GET SO HYPED UP!!!!!!!!!! THIS IS THE CASE RIGHT NOW. RIGHT THIS VERY INSTANT. AHHHHHHHHGGGGGGGGGGGG!!!!! Seriously, if you saw me right now...you'd think I was some sort of horridly hyper drug loving addict. LET'S GIVE IT UP FOR COOKIESSSSSSSSSSSSSS! AJFBNFRIGNITGMSCNIS COOKIES! As you may or may not know, my husband and I went on a baking spree over our fabulous 3 weeks home together. This, my friends, was awesome! 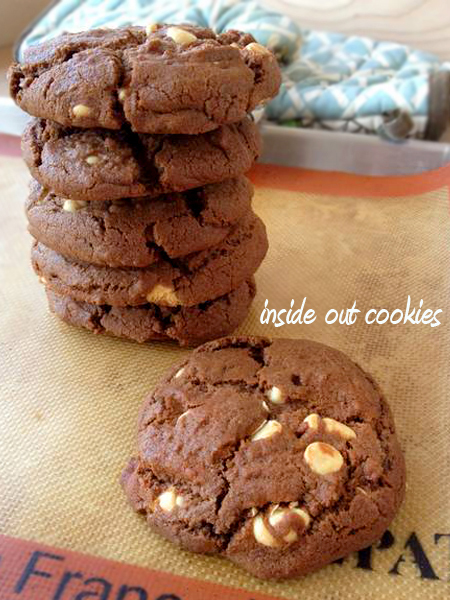 One of those fun yummies happened to be these delicious Inside-Out Cookies! They were so good, in fact, that I decided to share with you all! 2. In a bowl, sift together flour, cocoa powder, baking soda, salt, and instant coffee. Press any remaining granules through sieve. Set aside. 3. In a large bowl (or better yet- use your electric mixer), cream together your butter and sugars. Once your mixture has lightened in color and way fluffy, add your eggs- one at a time. Scrape bowl down after each egg addition. 4. Add in your vanilla extract. Mix together well. Slowly add your dry ingredients into your butter/sugar/egg mixture and mix together until just combined. Lastly, add white chocolate chips and mix in. 5. Using a 2" ice cream scoop, scoop out nice even amounts of dough and space apart about 1.5". This is going to make HUGE cookies. We wanted huge cookies. You don't? Use a smaller scoop and decrease the baking time. Just remember, these cookies will bake and spread out quite a bit. 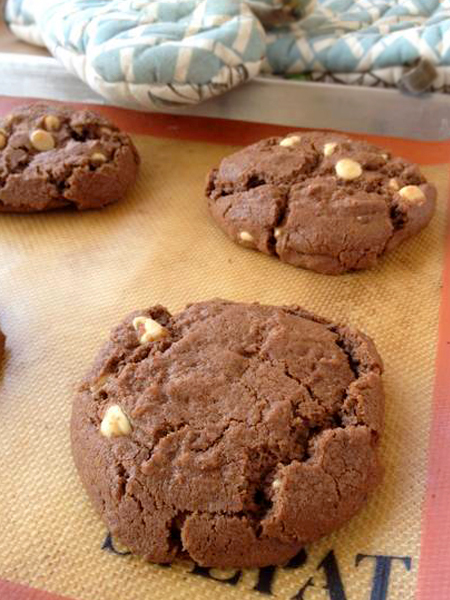 Bake about 16 minutes for a chewier cookie, 18 minutes for a crispier one. Again, if using the said 2" scoop. 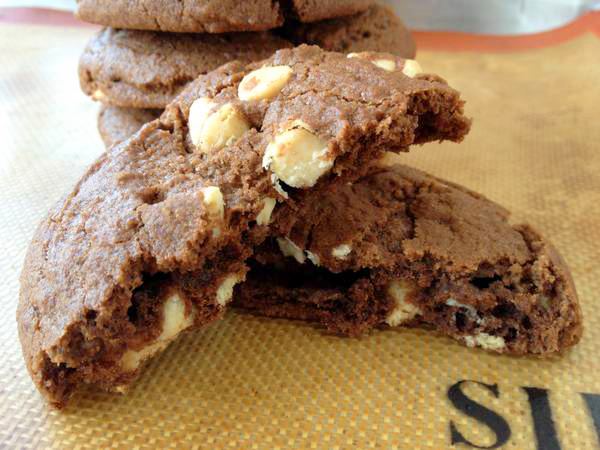 **Always check your cookies a few minutes before said baking time- everyone's oven temperature is a little different. They're done when they've flattened out a little and have a nice crispy top with cracks. Have a great Friday and weekend, friends! CAFFEINE MAKES ME CRAZY TOO!!!!!!!!!!!!!!!!!! I have that same oven mitt. Those cookies look amazing! I'm pretty sure I'll be making them sometime soon. Cute cookbook browsing outfit, BTW.